The Polaroid tablets which showed up at CES 2012 turned out to be quite a good deal, and from what I saw this week it seems like that trend could continue for another year. 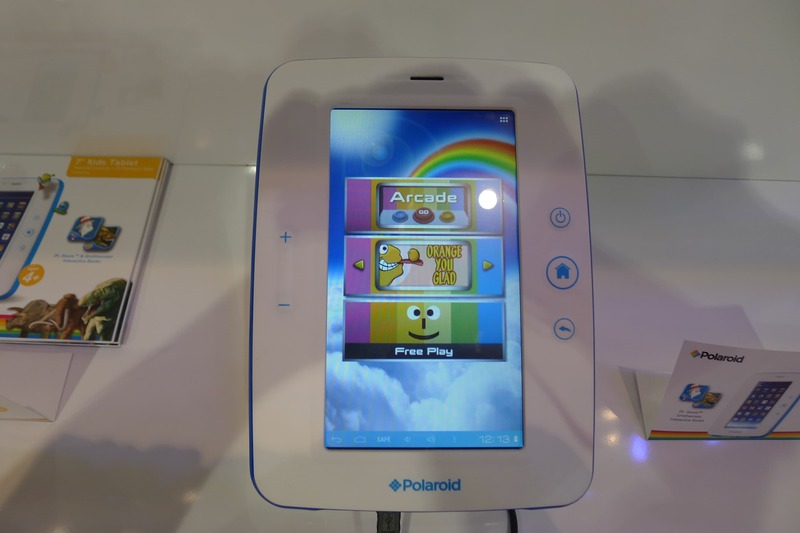 I dropped by the Southern Telecom booth at CES and they had quite a few Polaroid branded gadgets on display. I'm not really all that interested in the cases, speakers, and docks that ST is making for Polaroid, but the tablets are a different case. Southern Telecom had a half dozen (counting the mockups) different budget Android tablets on display, with screen sizes ranging from 5" to 9". All will have dual-core or quad-core CPUs, some models will have cameras, and most if not all of the tablets will ship with Google play (with the exception of the Kid's tablet). Spekking of the Kid's Tablet, I now know the model number: PTAB 750. I also played with it long enough to know that I was correct last week when I recommend against buying it. It's not a bad tablet when compared t the ones that came out 6 to 8 months ago, but aside from the solid construction it doesn't have much going for it. As a kid's tablet it only has a minimum amount of educational and kid's content slapped on top of a generic version of Android. Luckily Southern Telecom is working on a replacement with a dual-core CPU, higher resolution screen, etc, but the PTAB 750HD won't be out until Fall 2013. Until then you are better off getting some other kid's tablet which will offer a better value. But the rest of Souther Telecom's tablets are another matter. Those will likely all be worth buying just like the models released last year. On that note, I've heard elsewhere that Southern Telecom has sold several million tablets this past year. Luckily for me my source was not specific otherwise I wouldn't be able to share the info. I wasn't able to get specific specs on all of the rest of Southern Telecom's tablets, but I can say that there were a couple 5" models, several 7" models, an 8" model, a couple 9" models, and a 10" model. That's a pretty large family of tablets, so the specs are going to vary a lot between one tablet and the next. The signage indicated that all the tablet with screen sizes 7" and above will have dual-core CPUs, with at least the 10" tablet having a quad-core CPU. Some models will have Bluetooth, some will have cameras, and most if not all will ship with Google Play. The 7" tablets will probably start at a $99, and the larger tablets will likely start at under $180. You can expect to find the tablets in discount store chains like BigLots. In a way, I’m surprised that Southern Telecom has been so successful with these, but I really shouldn’t be. Picking decent quality budget tablets and renting out the Polaroid name has really worked out for them. Every time Big Lots get in a new model, they sell out very quickly. When they first started, a lot of people dismissed them because they weren’t able to sell through the big electronic stores. That may have been a good thing for them. One reason I bought my 701i without researching it was because Big Lots has a 30-day no question return policy. It turned out to be a great tablet for $100. Under $150 for a 9″ tab? Thats not too bad. I would check that out if it were decent, did the larger models have cameras? That is a must have part, at least for me. I was buying larger tablets for $180 or so some months back. I’d bet we will see see that price point, yes.